Galaxy A9 four cameras: A lens for every conceivable situation. Google’s Pixel 3 reveal came and went earlier this week, bringing us ever closer to the end of new flagship season. For Samsung, the past few months have revolved around the Galaxy Note 9, but the company saved a little something special for its next mid-range device. Samsung may have already announced a mid-tier handset with three rear cameras, the Galaxy A7, a couple of weeks ago. But today, it’s going one better with the new Galaxy A9, the world’s first quad camera smartphone. Normally I would snigger at such a transparent marketing ploy, but the whole package actually makes a lot of sense. Samsung calls the A9 a phone “optimized for the Instagram generation,” and it appears genuine thought has been put into what’s important (and what’s not) to this target demographic. The octa-core Snapdragon 660 processor is good enough — par for the mid-range course — but 6GB of RAM should help keep performance snappy. The 128GB of storage is the more interesting number. That’s plenty of room for all your Gen Z apps, selfies and music. What’s more, if you somehow clog all that up, a microSD card will grant you up to 512GB more space. There’s a big, bright 6.3-inch display for those late night YouTube sessions, and an above average battery capacity of 3,800mAh means the A9 will hopefully stay alive through that TED talk playlist until your alarm goes off the next morning. The new A9 is available in a couple of really flashy, but quite tasteful finishes. There’s boring black, and two bold, bright pink and blue options. There’s a gradient to them, sort of like Huawei’s Twilight color scheme, making the pink and blue both light- and eye-catching. The A9 is thin, featherweight and though its bright colors are the most attractive and memorable aspect of its design, a standard square with rounded corners is nothing if not comfortable in the hand. 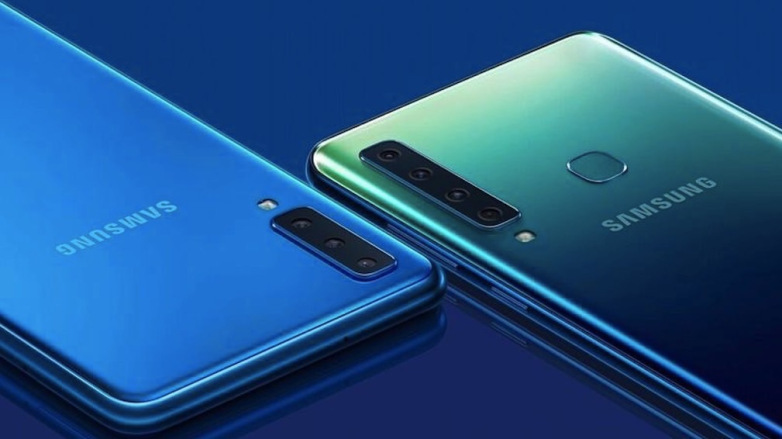 All of the above should be enough to sell the mid-range crowd on the A9, but we can’t ignore the fact this is the world’s first quad camera phone. Each of the four lenses does something different. The main camera, if there is such a thing here, is a 24-megapixel affair, while another lens is a simple 5MP sensor that captures depth information for the obligatory bokeh mode. Then you get a 10MP telephoto camera with up to 2x optical zoom as its unique feature, and finally an 8MP ultrawide lens with a 120-degree field of view (and slight fisheye effect). Oh, and there’s a 24-megapixel front-facing camera that should satisfy the requirements of any particularly demanding selfie kings and queens. The only real reason to put a total of five cameras on a phone is because you can, and to claim a ‘world first,’ which is gold for the marketing team. Still, maybe the “Instagram generation” will actually put all these different lenses to good use, in which case it’s not just spin, but valuable to the user, too. More cameras doesn’t automatically mean a better experience, of course — LG’s new V40 ThinQ is a good case study — and just a few days ago Google launched a pair of expensive flagships with a lone, primary camera. The Pixel 3 and Pixel 3 XL will still be very capable shooters, though, thanks mainly to Google’s software expertise. Samsung reps admitted that there are several phones out there that do great things with software, and the purpose of the A9 is to be as, if not more versatile by relying on the diversity afforded by good old-fashioned hardware. Having prodded around the viewfinder only briefly, I can’t yet call where the A9 sits on the line between practical and gimmicky.